Christopher Columbus here reporting on the run to Cape May and return to the Chesapeake Bay. Upon leaving Philly on Saturday morning, October 10th the crew cruised back down the Delaware River and anchored one night in the Cohansey River. 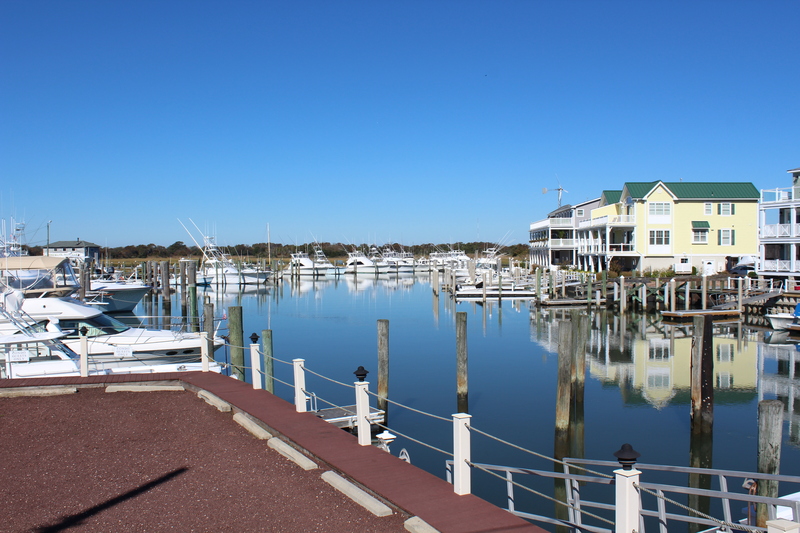 On Sunday, October 11th they arrived in Cape May, New Jersey to celebrate the completion of the 2015 northern run. 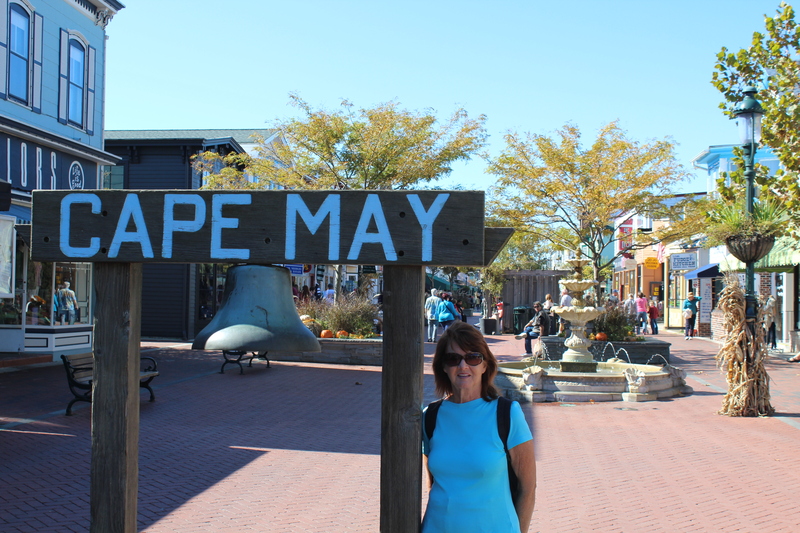 On Monday, the crew walked the town of Cape May and enjoyed the shops and Victorian Homes. 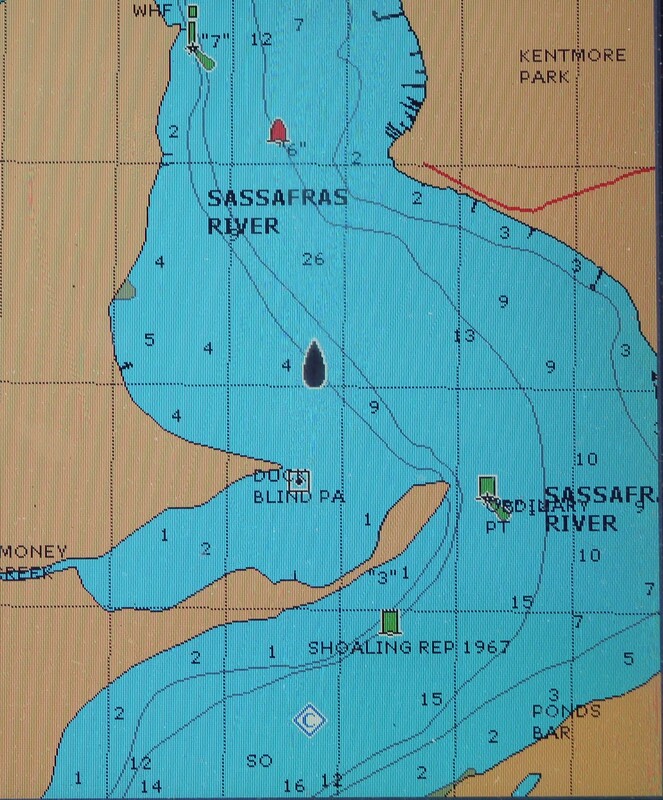 On Tuesday, October 13, the crew had a rough voyage back up the Delaware Bay to the Salem River anchor spot. 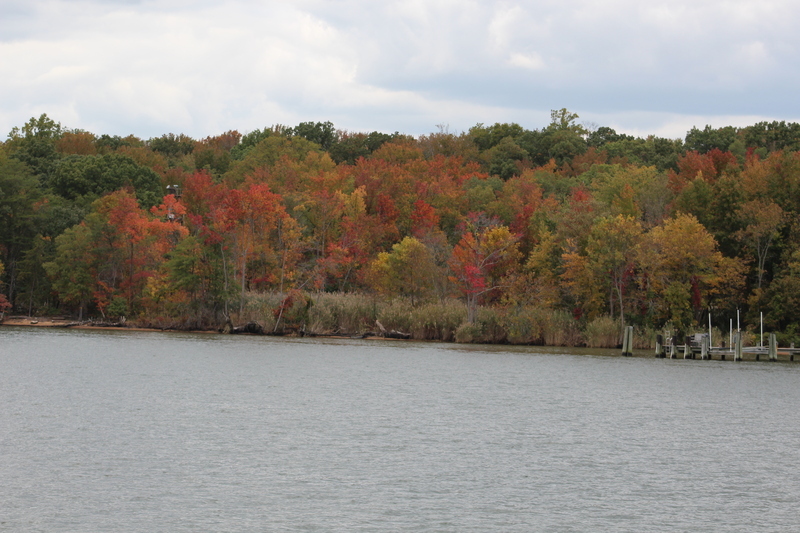 Wednesday found the crew passing back through the C&D canal into the Chesapeake Bay. The crew timed their departure from Penn’s Landing to coincide with the ebb tide so they could take advantage of the 1.5 knot current on the way down the river and bay. The weather was perfect for smooth sailing so the crew made a long day on the water and cruised 70 miles, their longest run to date. The crew pulled up into the Cohansey River at 1700 and set anchor for the evening. The run to Cape May was 40 miles and was relatively calm and smooth. 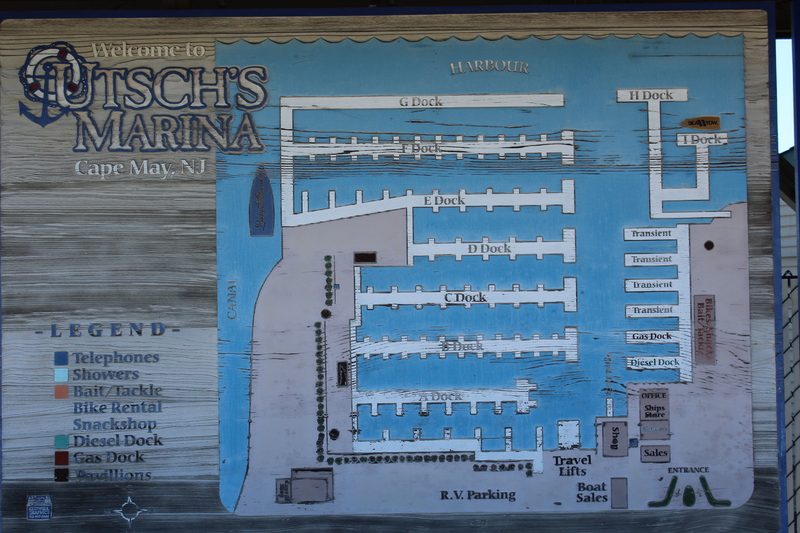 The crew docked at the Utsch’s Marina (pronounce like Dutch without the D). The crew ran into two other looper boats in the marina. One boat was from Maine and one boat was from New York. They are both headed south for the winter with plans to start the loop in the spring of 2016. After getting all settled in transient slip 16, the crew headed next door to the Lobster House for dinner. 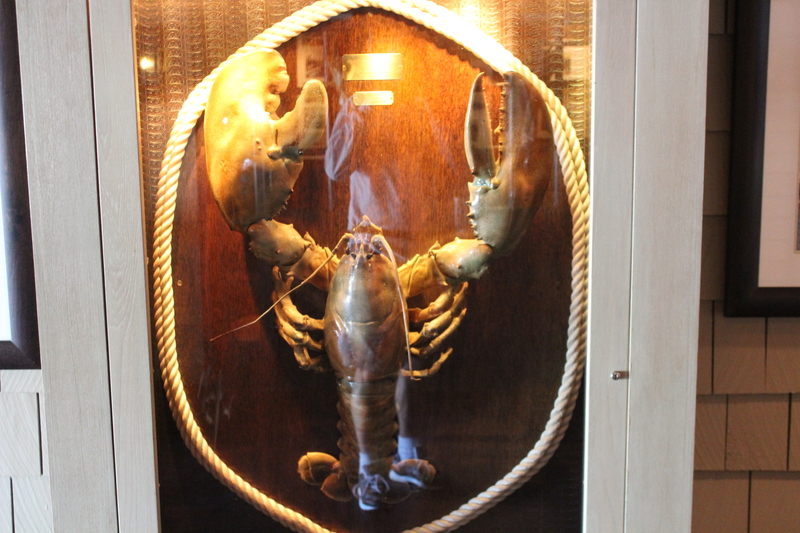 The restaurant has been serving fresh seafood in Cape May since 1922. The crew arrived early, around 1600, and immediately got seated. By the time they had completed dinner, the place was packed out with customers with a 40 minute wait to be seated. Did I mention that the place seats around 500. The mate had lobster and crab cakes while the skipper enjoyed fried flounder. Both were exceptional. The crew toasted their successful summer shake-down cruise and took the time to reflect on their travels. Claudia even got a fist bump and an ‘atta girl’ from an elderly woman sitting at the table next to the crew once the woman discovered that they had traveled up from Ft Myers. The women spent 10-15 minutes peppering the crew with questions about the voyage. It was a great way to celebrate the success of the trip. Yes, today is all about me……..It is Columbus Day! 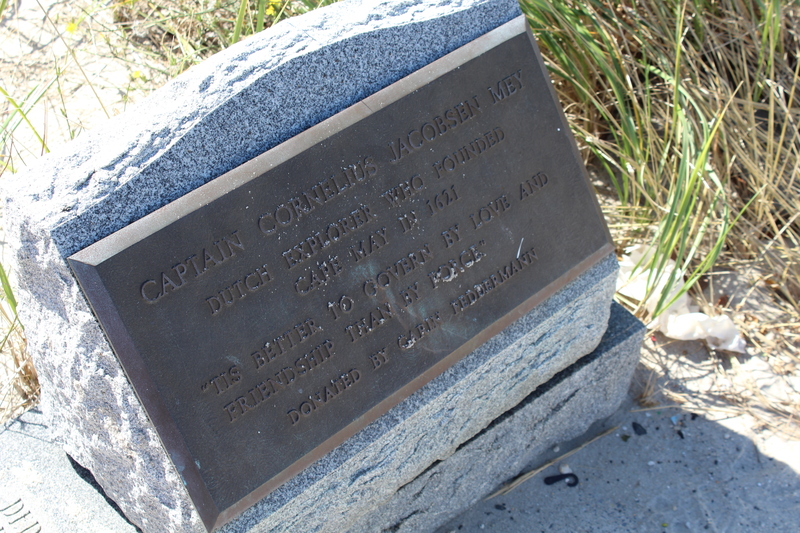 While I took the time to celebrate my achievements, the crew took a walk through Cape May. Washington Street is a 4 block area where no cars are allowed and only pedestrian traffic is on the streets. 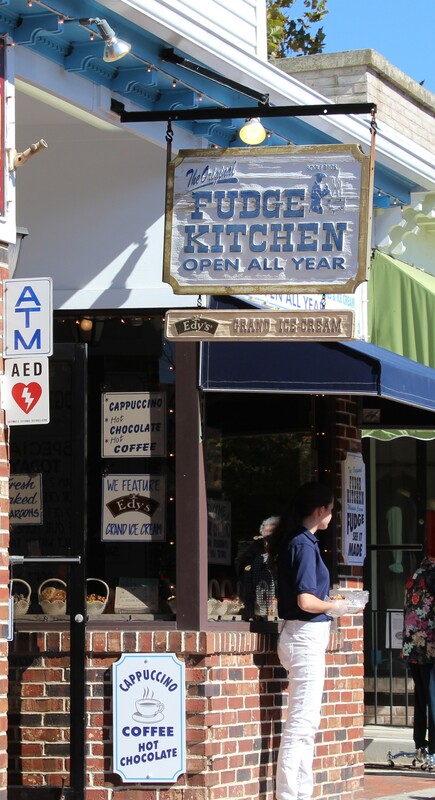 One of the best stops was the Fudge Kitchen for a 1 lb purchase of creamy peanut butter and chocolate fudge. After touring the Washington Street area, the crew set off to go see the beach and Atlantic Ocean. 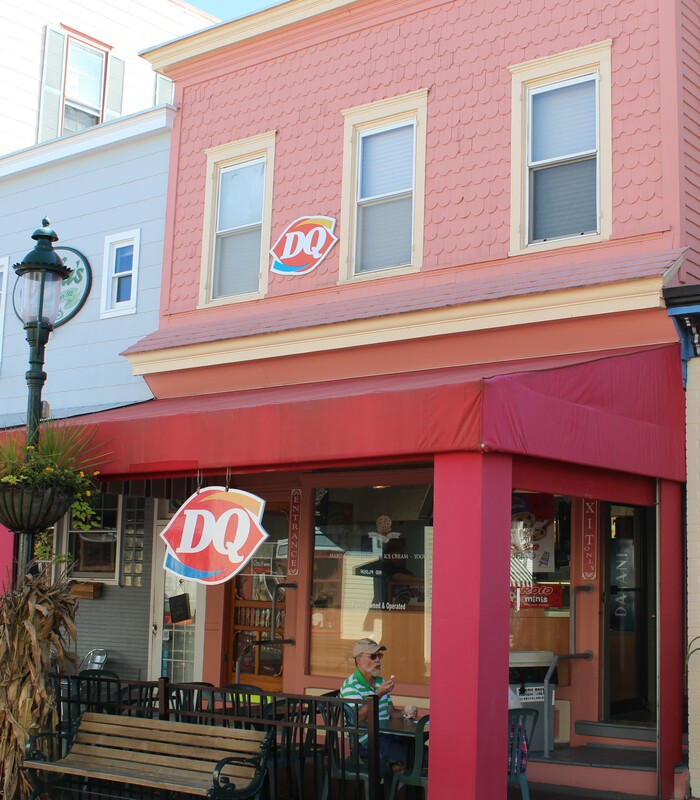 The street that fronts the beach is lined with restored Victorian Homes. The day was coming to a close so the crew hoofed it back to the boat. Good thing they bought that fudge for a little energy boost to make it back. While checking the weather report the skipper discovered that the winds would be blowing out of the west at 11-12 mph all day. With the run up the Delaware Bay being mostly due north this wind direction would cause the waves to strike the boat along its side causing some good rock and roll action. After leaving the Cape May Canal and turning to the North the ride became more than a little rough. The skipper used some of his old sailing tricks and tried tacking back and forth across the Bay while making some progress towards the north. After about three hours, the crew was past the widest part of the Bay. As the Bay began to narrow, the ride became calmer. Click on the pic below to watch a 3 minute video of Still Waters II in the bay. By 1500, the water had become nothing but a small chop so the crew discussed the idea of going further up the Bay to anchor back in the Salem River where they were about a week before. Estimating their speed and distance they calculated their arrival time to be about 1900. Sunset was scheduled for 1835. Based on experience that one can usually see for about 30 minutes following sunset and that they had anchored in this spot already, the crew decided to go ahead and cruise on up to the Salem River. Unfortunately they were not making good speed due to the ebb current and did not arrive at the mouth of the Salem River until 1900. The markers guiding the entrance up the river were flashing green and red so navigating the way in was not bad in the dark. However, at the last flashing green marker the crew still needed to go about a half mile in the dark and make a left turn. It was pitch black and hard to see. When the river “Y’d” and the crew needed to go left the houses lining the banks reflected enough light on the water that it became easy to see where to go again. By 1939 Still Waters II was safely anchored and the crew was ready for rest from a long day. The first order of business on Wednesday was to make sure the crew FaceTimed Emma Grace and wished her a happy 11th birthday. She is one of the crew’s Panda loving, cheerleading, princess grand-daughters. Happy Birthday Emma! While leaving the Salem River and crossing over to the C&D Canal the crew spotted four different Bald Eagles. One of the Eagles was actually sitting on a marker and did not fly until the crew was within about 20 yards. Future To Do List – While passing through the C&D Canal the crew decided to stop in Delaware City next time and take the time to ride their bicycles along the canal. Looks to be a bike path that runs most of the way along the north bank. 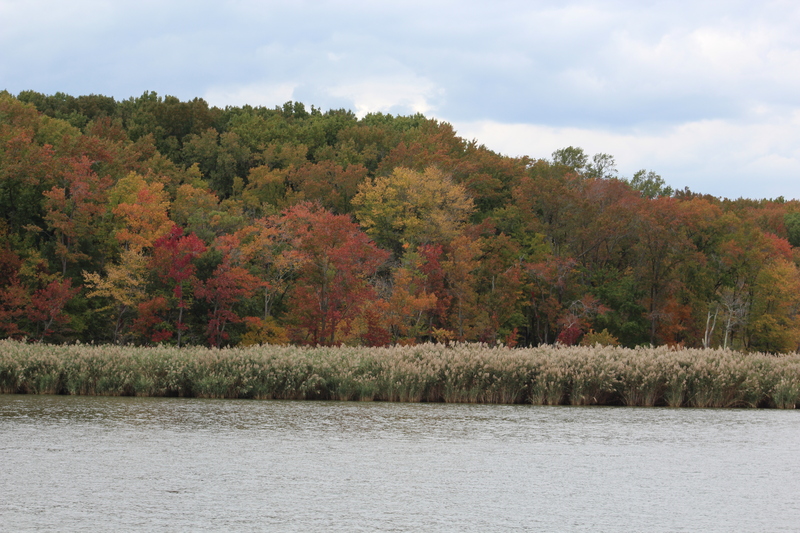 The cooler weather has really started the trees to start to turn colors and there were several areas along the banks that were spectacular. 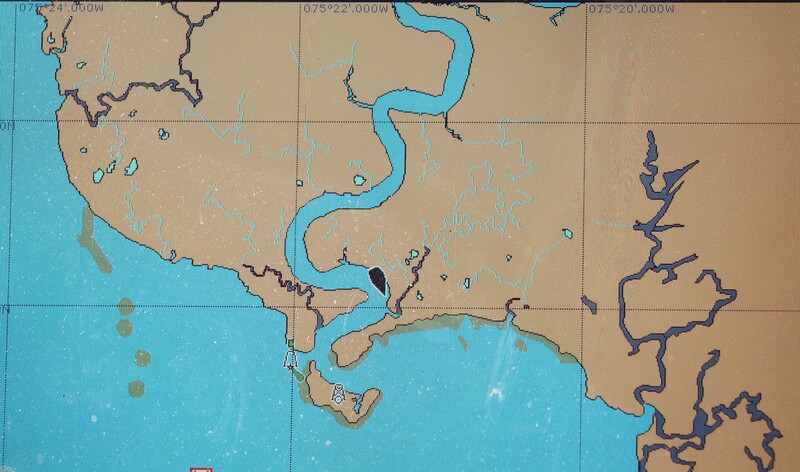 After leaving the C&D Canal the crew re-entered Back Creek, then the Elk River, and then back into the northern part of Chesapeake Bay. 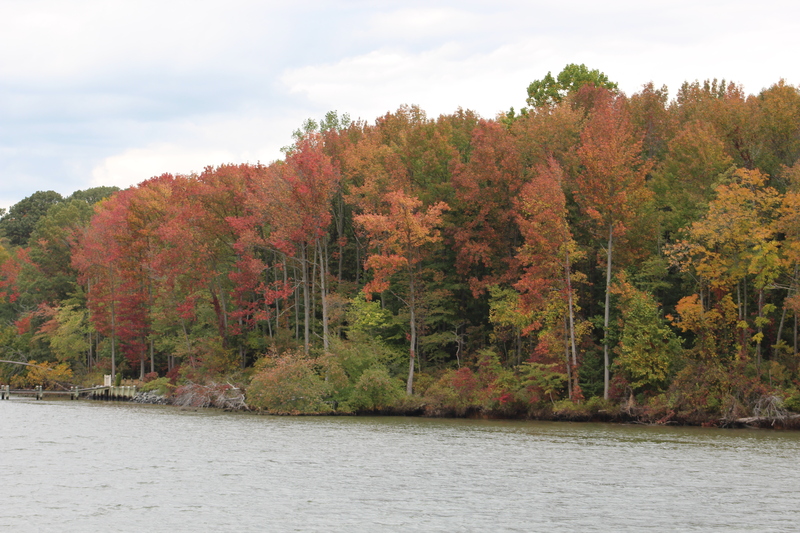 The crew took a turn off of the Bay and headed up the Sassafras River to find a place to anchor and bring a close to this 48 mile run. 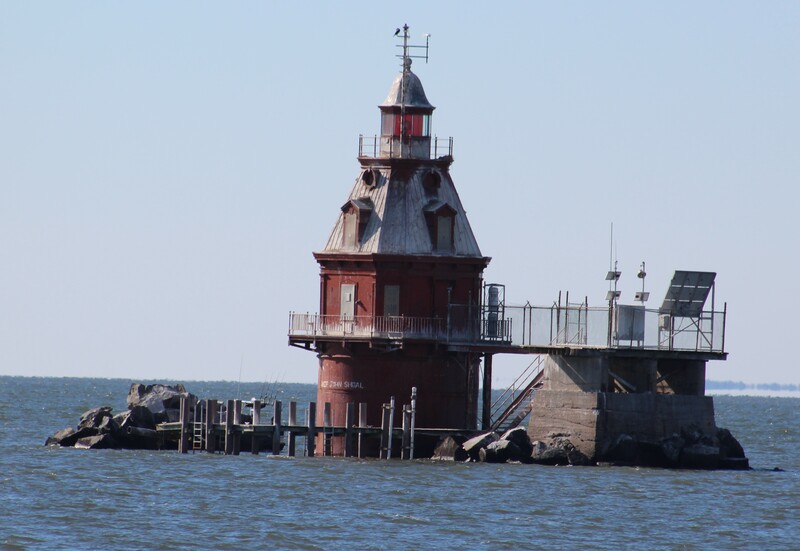 The crew plans to work their way down the east side of the Chesapeake Bay visiting St. Michaels, Oxford, and Tangier Island before returning to Norfolk. Stay tuned as they venture south into these new areas waiting to be explored. Oh good point, I don’t think of Ashlyn as a panda loving princess, i.e. in the same terms as Emma G, since I’ve never met her. You did not miss her, just do not see her. Ashlyn is doing well I hope and pray. One of? This is news to the Skipper’s sister. How did I miss the arrival of a great-niece?